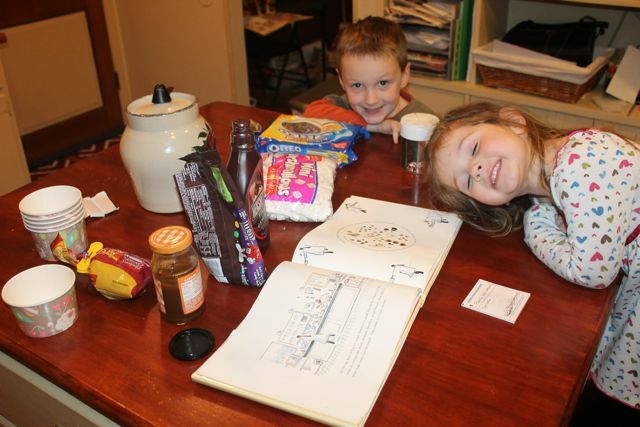 Our family reads a tremendous amount of picture books and most of those books are fiction. Fictional picture books are my preference. I really like a good story paired with beautiful artwork. My children enjoy a good story too, but they really like non-fiction books loaded with facts and photographs. Sometimes, I worry it is my fault we are not reading more non-fiction. This week, we found Elisha Cooper's non-fiction books to be the best of both worlds. His books are packed with the details you would expect from a non-fiction book, but he manages to highlight unique aspects of a topic and present them in a way that make his books story-like. His watercolor illustrations are loose and spontaneous, but realistic at the same time. I wasn't surprised that Elisha's books grabbed the attention of everyone in our family. Elisha Cooper is the author and illustrator of over fifteen books for children including Homer, Building, and Train. He grew up on a farm and apple orchard in Connecticut. His family did not farm the land, but there were many goats, cows, cats and a pony. 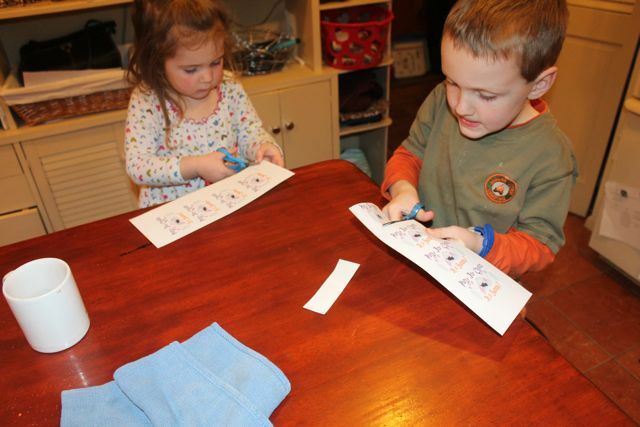 Elisha loved to draw the animals. "Carrying a notebook is something I did when I was young and something I do now. That hasn't changed. " (You Know for Kids). After graduating from Yale, Elisha was carrying his notebook when he was a messenger for The New Yorker. The sketches he made around the city became his first book, A Year in New York. 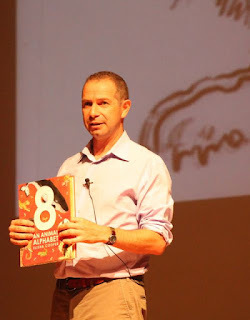 "It was after [this book] that someone suggested I write children's books." (You Know for Kids). 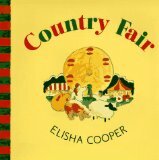 Elisha's first children's book was Country Fair. "I spent a fall sketching country fairs in New England. I drew huge bulls, huge pumpkins, and lots of pies. I liked watching oxen pulls. Also log chopping and sheep shearing. What interested me most may have been different from the reality; fairs are a mess of fried food and funnel cakes and spilled soda." (Elishacooper.com). At the Mazza Museum Summer Conference 2015 Elisha Cooper said that to draw it he has to be there. Furthermore, he told Publishers Weekly,"Sometimes I do my best work when I'm driving and am able to stop, walk in fields, and draw clouds." 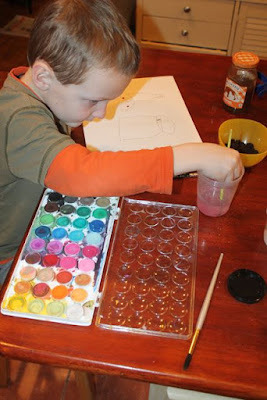 After Country Fair, Elisha Cooper went to create more non-fiction picture books on many interesting topics including Ballpark, Beach, and Farm. When asked about his process, Elisha Cooper said "I'm just looking for anecdotes, or gestures or images, that amuse me. Or that tell me something. I guess you could say I'm a believer in how little things add up to make something bigger that the thing itself." (You Know for Kids). His latest book is 8: An Animal Alphabet which is an ABC, counting, search-and-find book, and animal encyclopedia all in one! Our family highly recommends! 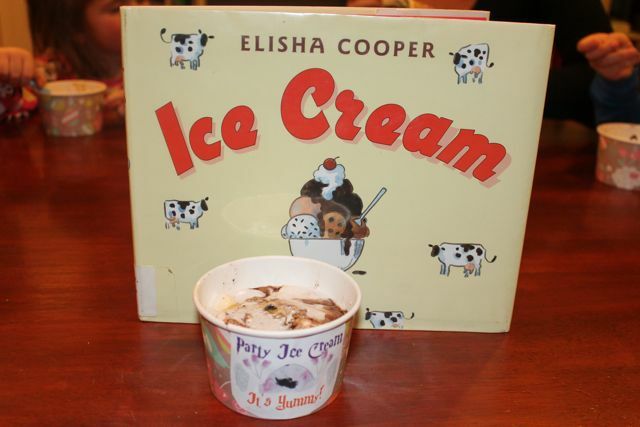 The non-fiction book that inspired our birthday celebration activity was Ice Cream. The book starts with the cows and the farm where the milk is gathered and then transported to the milk co-op. 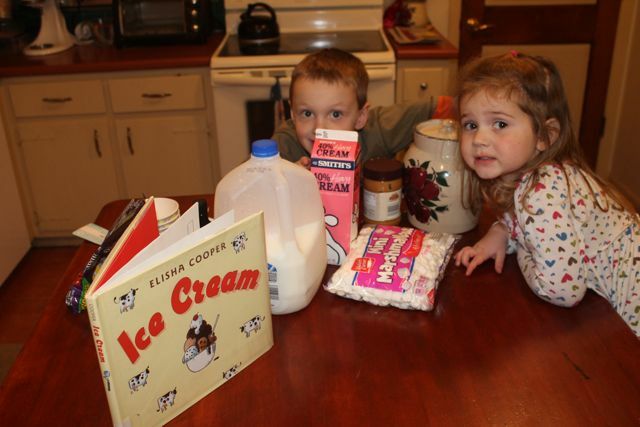 Our family loved the next part of the book when the milk arrives at the ice cream factory. 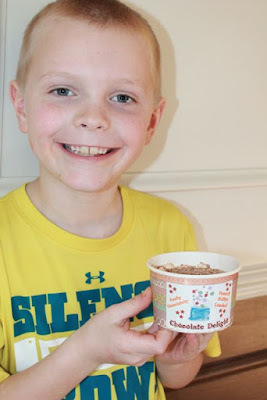 We learned about the small laboratory that creates the ice cream recipes, the special cartons that are printed with logos, and the machines that are used to package the ice cream before it is shipped to stores. 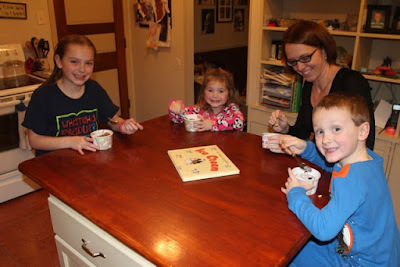 On Friday night, my youngest two children and I were at home by ourselves. The big kids and Mom had other social engagements. 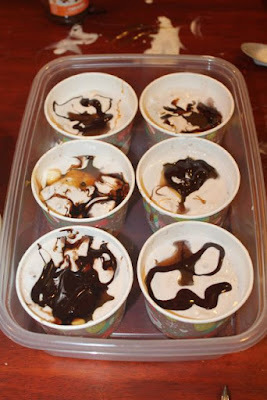 I thought it would be fun for us to pretend to be a small laboratory at an ice cream factory and invent our own ice cream! 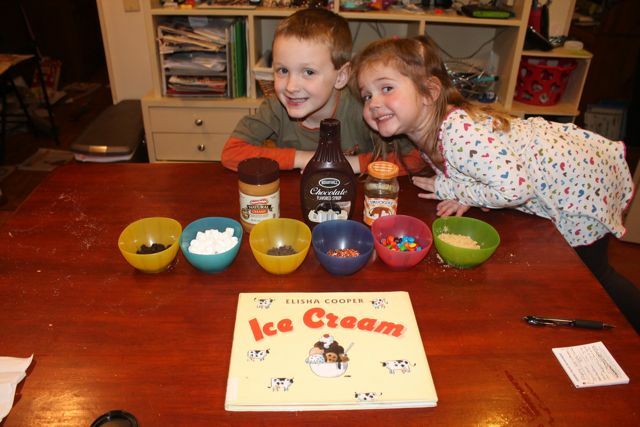 We gathered up all the ingredients we would need to make our ice cream. 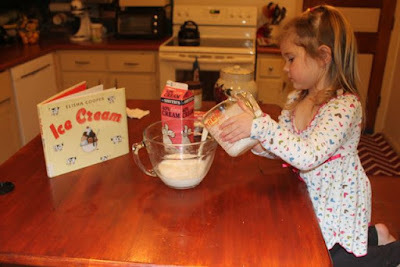 My daughter added heavy cream to the milk and sugar mixture. 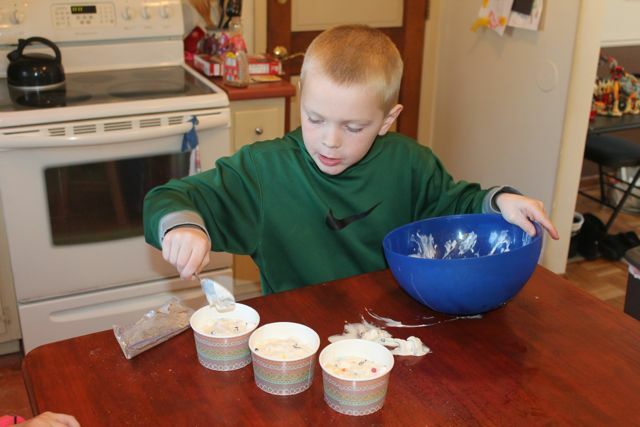 We talked about the small laboratory featured in the book and how they create the recipes. They prepared small bowls of ingredients to add to the vanilla ice cream. 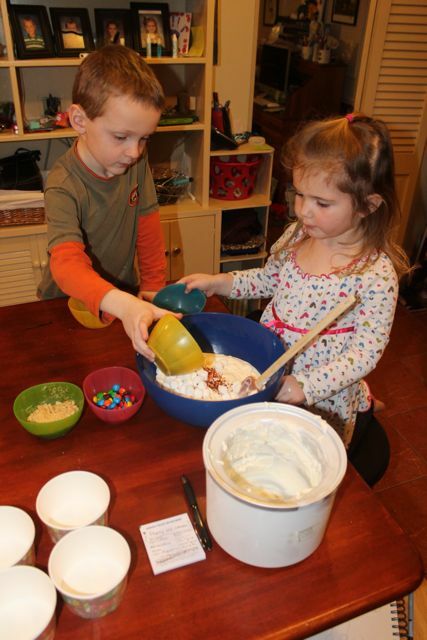 Their recipe included chocolate chips, marshmallows, crushed Oreos, sprinkles, M and Ms, and crushed graham crackers. They checked the progress of the ice cream in our ice cream maker. 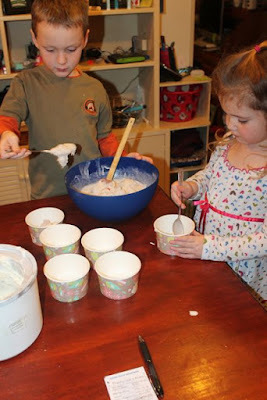 It took about 15 minutes to make our ice cream. 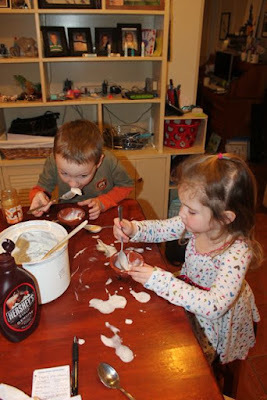 My son wanted to add "just a touch" of peanut butter to the vanilla ice cream. 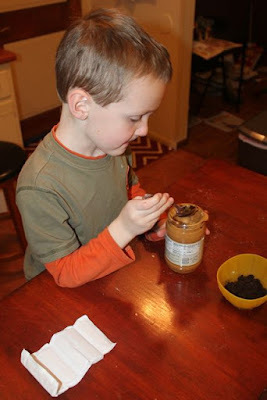 It was "just a touch" because he knew his older sister wouldn't like it if there was a lot of peanut butter. 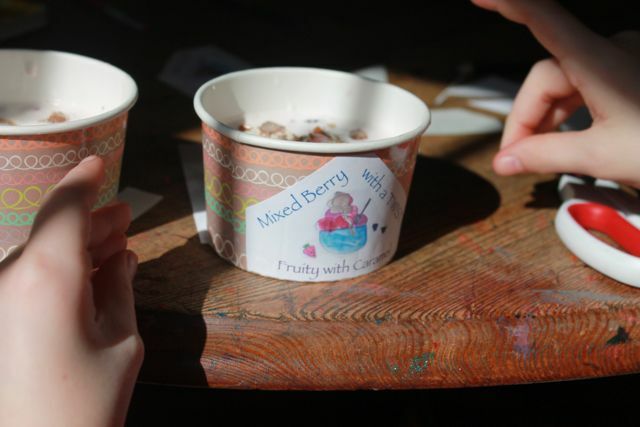 While the ice cream machine was working hard they designed their labels. 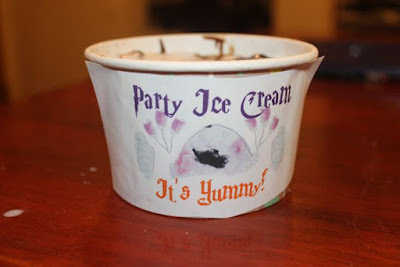 They decided on PARTY ICE CREAM as a name. My son drew a happy-face-ice-cream-scoop. Then, he used his watercolors. 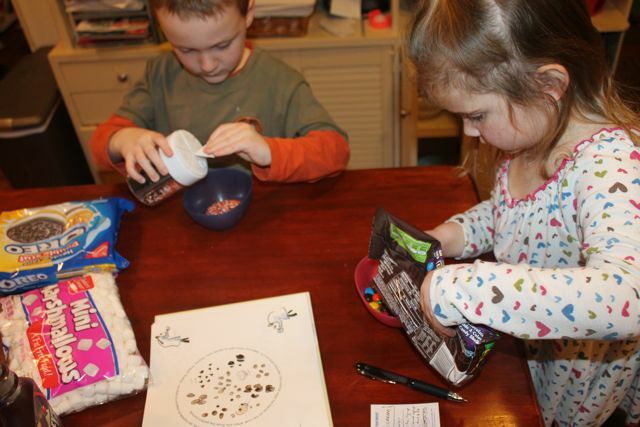 I asked my daughter, "What things do you find at a party?" 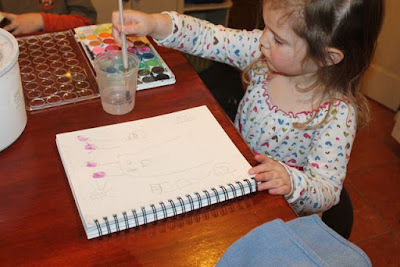 Then, she drew party bags and balloons. Hold that thought...our ice cream is done! 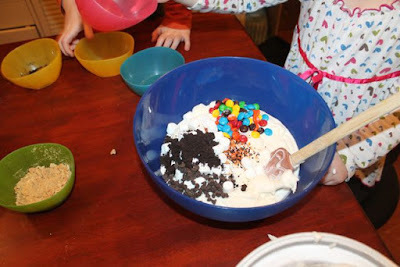 Once the ice cream was finished I scooped the ice cream into a bowl and they added the ingredients. Then, they scooped the ice cream into individual paper cups. 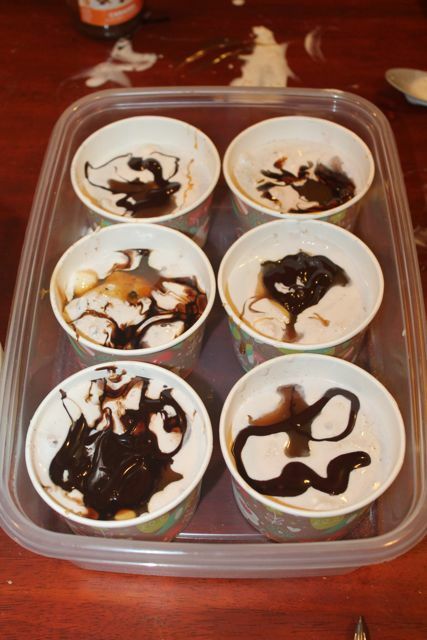 Caramel sauce and chocolate syrup were added to each. 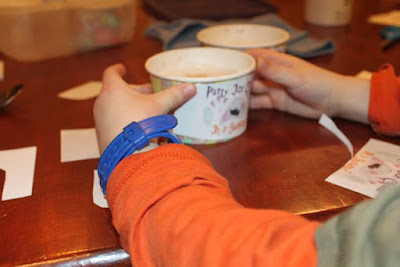 We placed the ice cream cups in a container and put them in the freezer until we finished our labels. Wait! We couldn't forget the most important job at the ice cream factory -- the "Ice Cream Taster"! 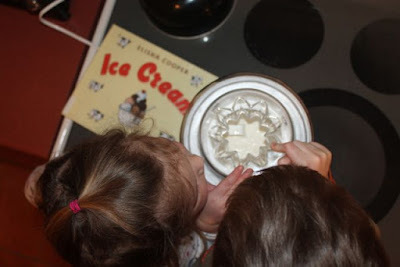 They tried the leftover vanilla ice cream from the machine and it tasted "marvelous!" 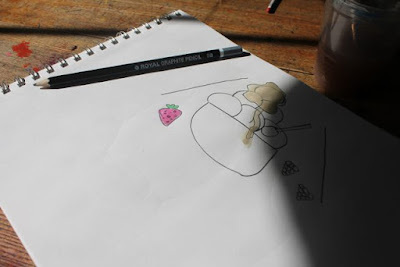 After we cleaned up the mess, she finished her illustrations for the labels. 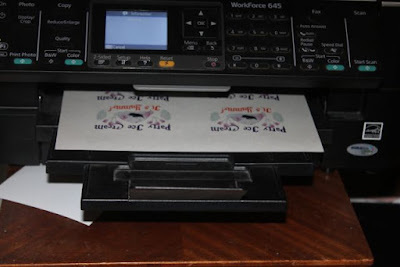 We scanned their drawings, added type, and printed out the labels. and placed on each cup. Party Ice Cream! It's Yummy! My son said, "It would be cool if we could go to the grocery store and see our ice cream there." 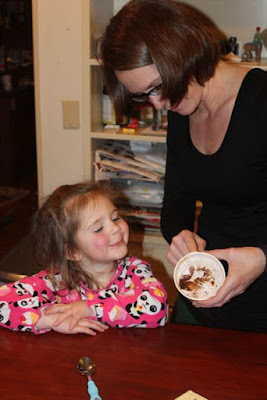 My daughter couldn't wait to show her mom the ice cream label! 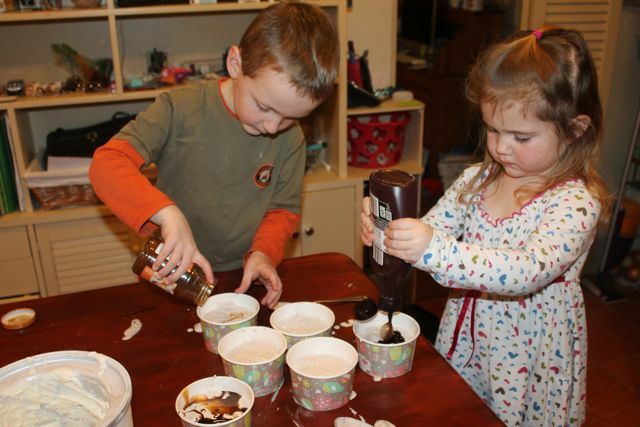 My two older children woke up on Saturday morning and wanted to invent their own ice cream too! 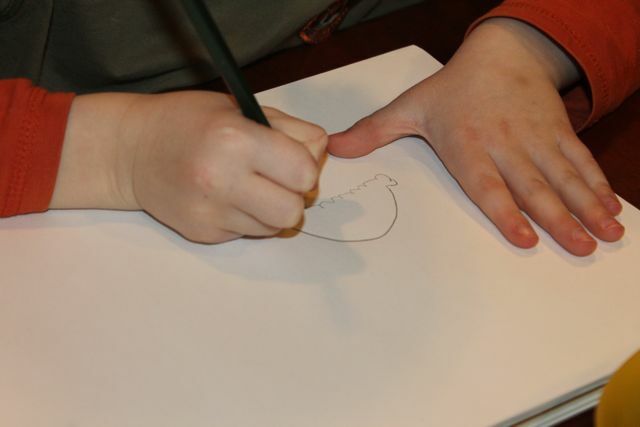 We were excited to find a 5B pencil without an eraser in our art kit which is what Elisa Cooper uses for his artwork! He described his approach to drawing, "I like to draw quick (I like sketching more than painting). 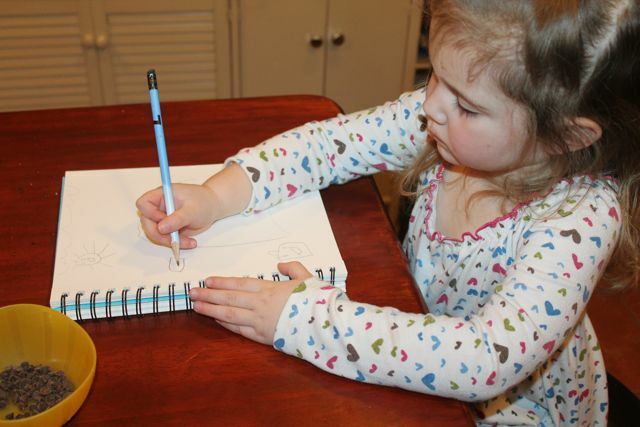 I want my pencil to be pretty free, to capture gesture and motion." (Publishers Weekly). Introducing MIXED BERRY WITH A TWIST. It's fruity with caramel. Introducing CHOCOLATE DELIGHT. It's chocolately and peanut butter loaded! In closing I thought I would share this quote from Elisha Cooper from an interview with Brian Floca and Publishers Weekly as they discussed his book Train, "With luck, Train is another piece of work that describes the world around us, whether it's dance or farms or trains. I just love being out in a field, sketching and taking notes, and I hope that children and parents come along for the ride." Elisha, our family came along for the ride this week and it was a treat! We wish you a wonderful birthday. 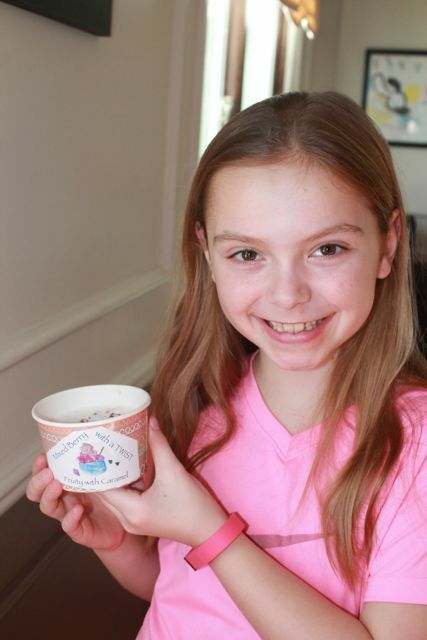 We hope you have a couple BIG scoops of ice cream with your cake! Thank you for sharing your birthday with me at Mazza!